"TCP/IP Illustrated," an ongoing series covering the many facets of TCP/IP, brings a highly-effective visual approach to learning about this networking protocol suite. "TCP/IP Illustrated, Volume 2" contains a thorough explanation of how TCP/IP protocols are implemented. 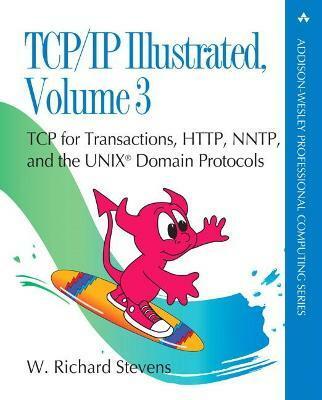 There isn't a more practical or up-to-date bookothis volume is the only one to cover the de facto standard implementation from the 4.4BSD-Lite release, the foundation for TCP/IP implementations run daily on hundreds of thousands of systems worldwide. Combining 500 illustrations with 15,000 lines of real, working code, "TCP/IP Illustrated, Volume 2" uses a teach-by-example approach to help you master TCP/IP implementation. You will learn about such topics as the relationship between the sockets API and the protocol suite, and the differences between a host implementation and a router. In addition, the book covers the newest features of the 4.4BSD-Lite release, including multicasting, long fat pipe support, window scale, timestamp options, and protection against wrapped sequence numbers, and many other topics. Comprehensive in scope, based on a working standard, and thoroughly illustrated, this book is an indispensable resource for anyone working with TCP/IP. Praised by reviewers and practicing TCP/IP programmers alike, the TCP/IP Illustrated series examines the many facets of the TCP/IP protocol suite using a unique and highly-effective visual approach that describes the inner workings of TCP/IP with detail, insight, and clarity. UNIX Domain Protocols, a set of protocols used heavily in UNIX implementations. As in the previous two volumes, the book is filled with examples and implementation details within the 4.4BSD-Lite networking code. The TCP/IP Illustrated series provides a complete picture of the protocol suite that drives the Internet, and gives programmers, system administrators, and serious users the information, understanding, and skills they need to remain at the forefront of networking technology. STEVENS, W. Richard, noted author of computer books died on September 1. He is best known for his "UNIX Network Programming" series (1990, 1998, 1999), "Advanced Programming in the UNIX Environment" (1992), and "TCP/IP Illustrated" series (1994, 1995, 1996). Richard was born in 1951 in Luanshya, Northern Rhodesia (now Zambia), where his father worked for the copper industry. The family moved to Salt Lake City, Hurley, New Mexico, Washington, DC and Phalaborwa, South Africa. Richard attended Fishburne Military School in Waynesboro, Virginia. He received a B.SC. in Aerospace Engineering from the University of Michigan in 1973, and an M.S. (1978) and Ph.D. (1982) in Systems Engineering from the University of Arizona. He moved to Tucson in 1975 and from then until 1982 he was employed at Kitt Peak National Observatory as a computer programmer. From 1982 until 1990 he was Vice President of Computing Services at Health Systems International in New Haven, CT, moving back to Tucson in 1990. Here he pursued his career as an author and consultant. He was also an avid pilot and a part-time flight instructor during the 1970's. He is survived by his loving wife of 20 years, Sally Hodges Stevens; three wonderful children, Bill, Ellen and David; sister, Claire Stevens of Las Vegas, NV; brother, Bob and wife Linda Stevens of Dallas, TX; nieces, Laura, Sarah, Collette, Christy; and nephew, Brad. He is predeceased by his parents, Royale J. Stevens (1915-1984); and Helen Patterson Stevens (1916-1997). Helen lived in Tucson from 1991-1997, and Royale lived here in the early 1930's attending Tucson High School while his father was treated for TB at the Desert Sanitorium (now TMC). The family asks that in lieu of flowers, donations be made in Richard's name to Habitat for Humanity, 2950 E. 22nd Street, Tucson, AZ 85713. A memorial service for Richard will be held at St. Phillip's in the Hills Episcopal Church on Tuesday, September 7th at 12:00 noon. Following the service there will be a reception in the Murphy Gallery of the Church. Please wear colorful clothing to the service; Richard loved colors.